Johann Fust Foundation Book Sale Monday, Nov. 13 through 9:30 a.m. to 5 p.m. Johann Fust Library, 1040 W 10th Street, Boca Grande Hundreds of almost-new and used hardback and trade paperback books, DVDs, CDs and rare books. Come and do your holiday gift shopping. The sale runs Monday, Nov. 13 and Tuesday, Nov. 14 from 9:30 a.m. to 5 p.m. and Wednesday, Nov. 15 from 9:30 a.m. to noon. Call (941) 964-0211 for more information. The Sunshine State No Appointments and a Tank of Gas Tuesday, Nov. 14, 2 p.m. Boca Grande Community Center’s Auditorium Interested in a different perspective on Florida history & landmarks? The Boca Grande Historical Society presents Tim Dorsey, New York Times best selling author of 20 novels and a recipient of the John D. MacDonald Award for excellence in Florida fiction. For more information and to purchase the $15 tickets see BocaGrandeHistoricalSociety.com or call (941) 964- 1600. Tim Dorsey’s books will be available for purchase at the event. Royal Palm Players: Duets Wednesday, Nov. 15 through Saturday, Nov. 18 Boca Grande Community Center’s Auditorium The curtain opens with “Duets” a staged reading on Wednesday., Nov. 15th through Friday, Nov. 17 at 7 p.m. and on Saturday Nov. 18 at 5 p.m. Please stop in the Royal Palm Players Office, located at the Boca Grande Community Center, for your season tickets or you can purchase tickets online at RoyalPalmPlayers.com, by phone (941) 964-2670 or at the box office. The office is located at 131 First St. W. at the Boca Grande Community Center. Boca Grande Art Center’s Fall Art Exhibit Member’s Opening Reception Thursday, Nov. 16, 5 to 7 p.m. Boca Grande Art Center, 236 Banyan Street, Boca Grande The Boca Grande Art Center along with Gulf to Bay Sotheby’s is hosting a “Welcome Back -Members’ Opening Reception”on Thursday, Nov. 16, from 5 to 7 p.m. The fall show continues Friday, Nov. 17 & Saturday, Nov. 18, from 10 a.m. to 5 p.m. and on Sunday, Nov. 19, from 10 a.m. to 4 p.m. Come to the Art Center where paintings, sculptures, jewelry and more are on display for sale, all created by local artists. For more information call(941) 964-1700. Lighting of the Village: Holiday Christmas Celebration Saturday, Nov. 18, 5:30 to 9 p.m. Fishermen’s Village, 1200 W Retta Esplanade, Punta Gorda All are invited to come and be festive and enjoy viewing over one million lights and holiday themed decorations. There will also be parade, live music, photos with Santa, refreshments and so much more. Admission is a canned food item or toiletries to be distributed by Share the Blessing Ministry. For more information see fishville.com Turkey Hoop Shoot Saturday, November 18, 10 a.m. Boca Grande Community Center, 131 First Street West, Boca Grande All ages are encouraged to attend, winners in many age categories. Registration will take place the day of the event between 9:15 a.m. and 9:45 a.m. Shoot the most hoops in your age category and win great prizes! The three top competitors in each age division will advance to the final round. Call (941) 964-2564 for more information. 2016 Gasparilla Island Fly Fishing Tournament Tuesday, November 21, 9 a.m. to 3 p.m. Entry fee is $300 per two-angler team. The cocktail party/ captain’s meeting is on Monday, Nov. 20 at 6 p.m. at P.J.’s Seagrille in Boca Grande. Anglers depart from the Pink Elephant Docks in Boca Grande on Tuesday. Tickets are $35 at the door for cocktail party, everyone is invited. Monies raised go to the Boca Grande Pass and Sunset web camera projects. Call Gasparilla Outfitters at (941) 964-0907 or go to GasparillaOutfitters.com Happy Thanksgiving! 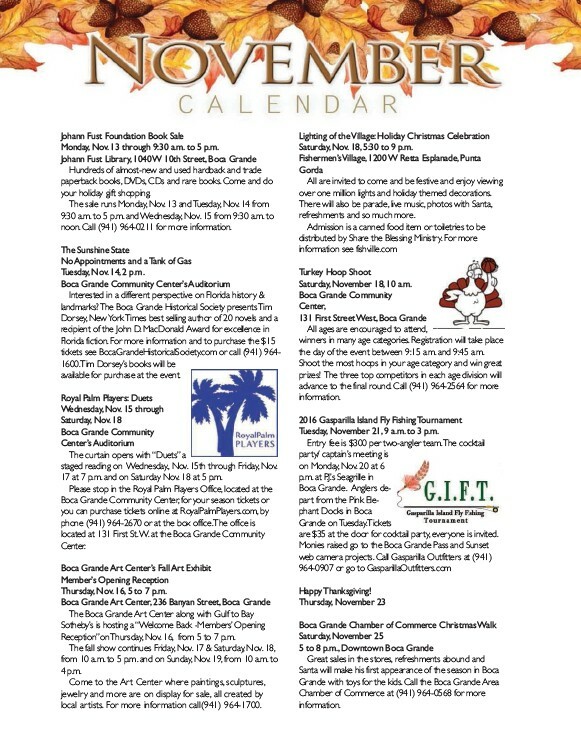 Thursday, November 23 Boca Grande Chamber of Commerce Christmas Walk Saturday, November 25 5 to 8 p.m., Downtown Boca Grande Great sales in the stores, refreshments abound and Santa will make his first appearance of the season in Boca Grande with toys for the kids. Call the Boca Grande Area Chamber of Commerce at (941) 964-0568 for more information.